Galvanized sheet metal is used in places where the architects manipulated the home’s skin by pushing it out or carving it away. 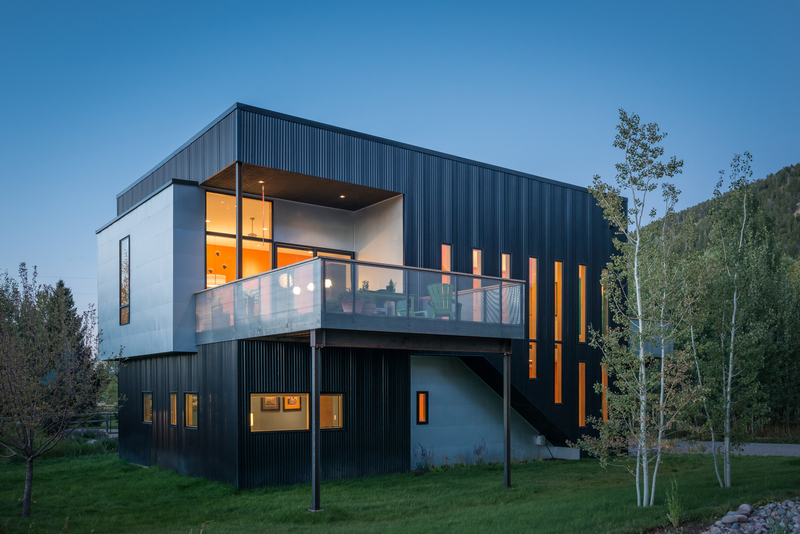 The rest of the residence is wrapped in black corrugated sheet metal. “We looked for exterior materials that were made with recycled content and available in large amounts, so as to reduce the number of hours painting the stuff,” Logan says. IKEA cabinets, Caesarstone counters, and white Dune tiles by modularArts accent the open-plan kitchen. A Viking refrigerator and dishwasher stand near a Capital range. A pair of black Masters Stool by Kartell provide places to sit along the island. A polished chrome faucet from Kohler’s Purist collection enhances the kitchen. Walls and ceilings are made of drywall and painted brilliant hues that complement the home's industrial exterior. Made of stainless steel and TEKA hardwood, a Curzon dining table by Modloft is surrounded by a quartet of Victoria Ghost dining chairs by Philippe Starck for Kartell. A striped Missy pendant light by Filipe Lisboa hangs overhead. Four Chill White media consoles from CB2 line the western wall. A Cascade suspension light by Ango hangs over the stairway. Extra-thick, exposed concrete floors contribute to the home’s radiant heating and cooling system. “There’s more upfront cost, but because Jackson’s heating season is so long, it’s actually a very economical choice,” Logan says. A Kite wall sconce by Foscarini and mirrors from Gedy by Nameeks are installed above a polished chrome faucet from Kohler’s Purist collection. Dotted with colorful footholds, a climbing wall covers one side of the home, allowing roof access. A Coral Pendant by David Trubridge hangs in the master suite, which opens up to a large deck. After living in Jackson, Wyoming, for nearly two decades, writer and athlete Dina Mishev was ready to build her dream home. She invited her friends at Carney Logan Burke Architects to design an inexpensive residence that made strategic use of her landlocked, view-challenged property. The project’s tight budget (approximately $500,000 to build and furnish) prompted a simple rectangular frame. “We asked ourselves, 'How do we make this box a beautiful box? '” principal Eric Logan says. They carved away corners and added rhythmic glazing to provide maximum views and natural light. In response to the site’s limited buildable area, Logan’s team ingeniously pushed the living areas up to the second floor, creating an upside-down version of a traditional home. A garage and two bedrooms comprise the lower level, with an open kitchen and living room on the top floor with the master suite. Features like standard-sized windows, drywall ceilings, and exposed concrete floors kept costs down. A climbing wall, Mishev’s idea, provides roof access from one side of the house.